A working model of a passive solar house. Students develop an understanding of the greenhouse effect, and methods of collection and storage of solar heat. 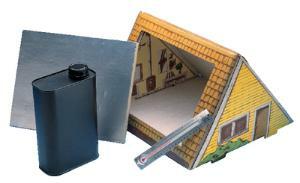 Comes with a thermometer, water storage container, dark and light modular storage panels, an insulation panel and a teacher's guide. We recommend you use our Infrared Lamp and Reflector for experiments indoors. The Infrared Light and Reflector set consists of a thermo-glo bulb, a push switch socket, an aluminum reflector, and a 2 m cord. The aluminum reflector has a vinyl-covered spring clamp with a double ball swivel. The lamp is 125W and has a medium screw base.